Sing-Along version of the 3D animated video and song with the lyrics onscreen for you! The song and video is about a family who are visited by a series of animals who greet them with Bonjour, Ohayo, Kia Ora or Hola, Ni hao or G’Day. The children put the animals in various places until there’s no room for the family in the house so there’s a surprise ending! Great for children 0 to 7 years and the actions are done by the characters in the video. Ideal for developing co-ordination in little ones and following cues by copying the actions. And it’s a song that will stay with you! Choose from 2 videos – Australia/New Zealand version (uses Kia Ora) or outside Australia/N.Z. (uses Hola instead of Kia Ora and is great for U.S., South America, U.K., Europe, Asia, etc.) Both videos are available as “original” or “singalong”. Having the lyrics on-screen assists children who can read, or are learning to do so, as well as being a great video for children who are deaf or hard of hearing. And adults love the help with the lyrics! The added bonus is that by purchasing this video for a small cost you can watch it ad free and offline at any time! Plus, you are directly supporting the community book donation program to disadvantaged and sick children. There are many matching products to Toodle… 4 videos at $3.90 each, the downloadable mp3 $1.99, the 24 page book with CD and song download included at $24.90, and a set of 6 very cute soft finger puppets to match the animals in the song-story at $19.90, and the ultimate gift…. our complete set which features all 11 products in a gift pack for $49.90. There are also ideas for using these products under the menu “Tips and Ideas”. A short preview of the Toodle book is below (plus a preview of Black and White Cow which is also available as a complete set…. 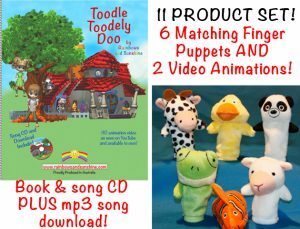 The complete Toodle 11 product set of videos, 24 page book with CD and downloadable mp3 and 6 finger puppets is shown below ($49.90).